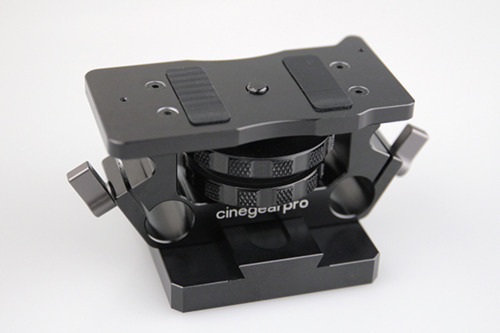 I found this on ebay today, has anyone had any experience with this baseplate? It looks pretty slick. It is made by Lanparte, in fact. For me, design is not very good. On good tripods you do not need this horizontal adjustments. But vertical one you need is absent. My experience is the more horizontal adjustment, the better. You might nave a giant zoom or telephoto lens that could throw it all off and exceed the tripods adjustments to balance the rig. For example I had a RED MX that I recently sold, and I had a 3 part dovetail system between the camera and O'conor head that moved the camera a full 12 inches to compensate for balance. As for vertical adjustment, most DSLRs are close in height with exception of 1D's and camera's with battery grips. I'm not too concerned about the vertical adjustment. I'm more concerned about the build quality. Vitaliy, do you know anything about that? Cheap macro sliders exist, up to 30cm for this :-) They are sturdy. Or you can order longest QR plate from manufacturer. I think quality is good, as always.